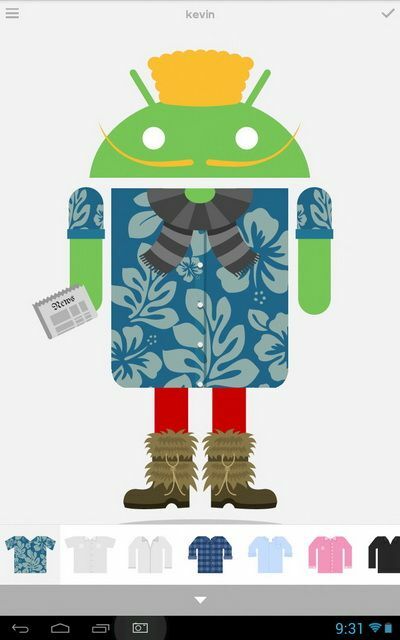 We have all seen the new Google TV adverts for Android and new devices with the android characters. Which with the androidify app you can create an Androidified version of yourself, you can pick from various body shapes, hairdos, clothes, accessories and more. Now the app has been available for a few years, but Google have updated the app inline with new advertising campaign and the release of Android 5 Lollipop. The new version does add some cool features in that you can animate your character to do waves, dances etc. Once you are happy with you creation you can share to your device or a range of social networking services like Facebook, twitter etc. The app is very easy to use, at the bottom of screen are the icons for hair, upper & lower body clothing, shoes, eyewear, accessories etc, to change the shape of your android just pinch up or down on either legs, arms, body, head etc. Though a very basic app it is fun for both adults and children. Though after you have created a few android characters you probably won’t really go back to it, but for a free small download it is worth a look. Here is the official Google description. – Pick a move and watch your Android character laugh, dance, cheer, rock out, or all sorts of other moves. – Share your characters as emoticons & GIFs. – Share your characters on Androidify.com and they could get picked to be in an Android TV commercial or YouTube video. – Lots of new clothes & accessories to choose from. – A new and improved UI.